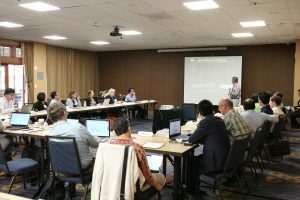 Over 30 specialists and scholars were invited by the NSF IBSS and IMEE project team, consisting of PI Ming-Hsiang Tsou (Geography) and Co-PIs Brian Spitzberg (Communication), Jean Mark Gawron (Linguistics), Heather Corliss (Public Health), Jay Lee (Geography, Kent State), Xinyue Ye (Geography, Kent State), Xuan Shi (Geosciences, U of Arkansas), Atsushi Nara (Geography, SDSU), Xianfeng Yang (Civil Engineering, SDSU), and Sahar Ghanipoor Machiani (Civil Engineering, SDSU). The meeting included plenary presentations by invited experts, lightning talks, and focus group discussions. This workshop generated a final report to be published on the IBSS and IMEE project website. This year, our research theme was “Social Media Analytics and Decision Support Systems: Applications to Public Health and Crisis Management”. The dynamic supply of big data from millions of social media messages, GPS tracks, medical records, wireless sensors, electronic health records, web pages, and cellular phones, becomes an important research domain. Big data provide untapped potentials for analyzing dynamic human problems and enabling intelligent decision support systems for business analytics, disease outbreaks, crisis management, traffic patterns, urban dynamics, bioinformatics, and environmental changes. Big data offer golden opportunities for scientists to develop new smart decision support systems, which require transdisciplinary collaboration and research methodologies to integrate multiple perspectives into collaborative research endeavors. This workshop will build a collaborative platform for scientists and researchers to work together. Specific research questions addressed in the workshop included: 1. What theoretical models can facilitate prediction of public health crisis information diffusion and response?2. What are some innovative ways that health behavior theories have been applied to understanding the influence of social media on human behavioral health and health outcomes? 3. What critical information are potentially obtainable through crowd sourcing during crisis management, and what is an efficient process to produce insight and use this information?4. How to effectively consider the uncertainty of evacuation demand and deal with the trade off between efficiency and robustness in the evacuation model?5. Regarding user interface design and functionalities on a web-GIS based decision support system for crisis management, what are key elements that can be beneficial to stakeholders?